The first snowflakes descended around 5:30 PM. I thought little of it; there wasn’t that much snow in the forecast, and by the time it amounted to anything everyone should home and snug. Little did we know. Portland doesn’t do well in snow. We’re much more accustomed to endless gray days in the winter, with light rain coming often enough that the ground never really dries out. 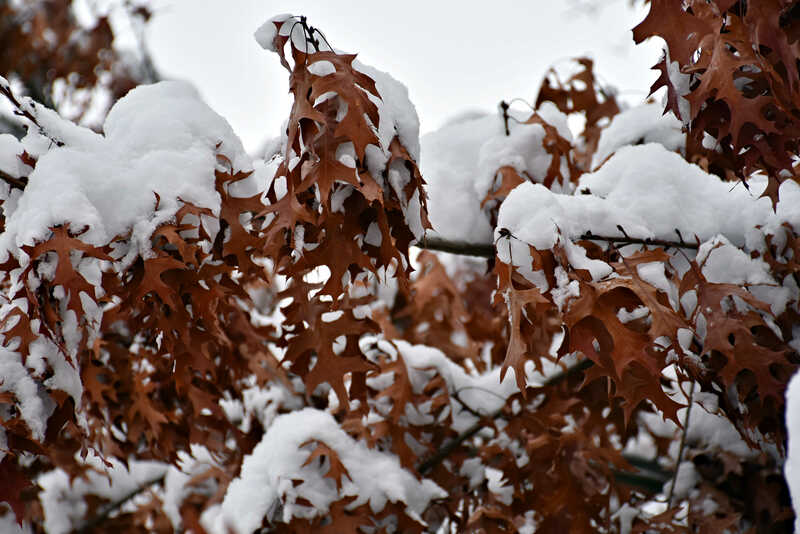 Snow, when it comes, will melt within a couple days, providing temporary havoc while it visits. I first moved to Oregon from Minnesota in the late 70’s, initially to Eugene, 100 miles south of Portland. Being unemployed and broke I had little to do but sit in my boarding house room and listen to the radio. 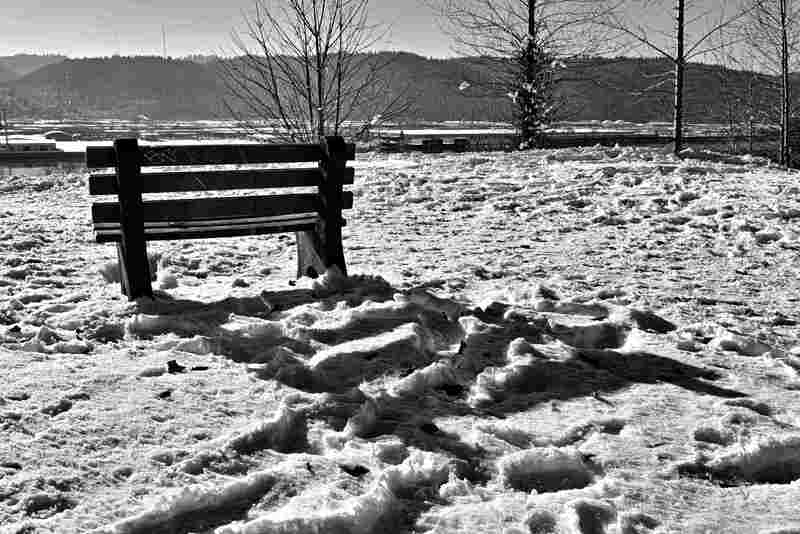 One winter morning the DJ’s talked about how Portland had 4″ of snow, and the city was basically shut down. I about fell off the bed laughing. 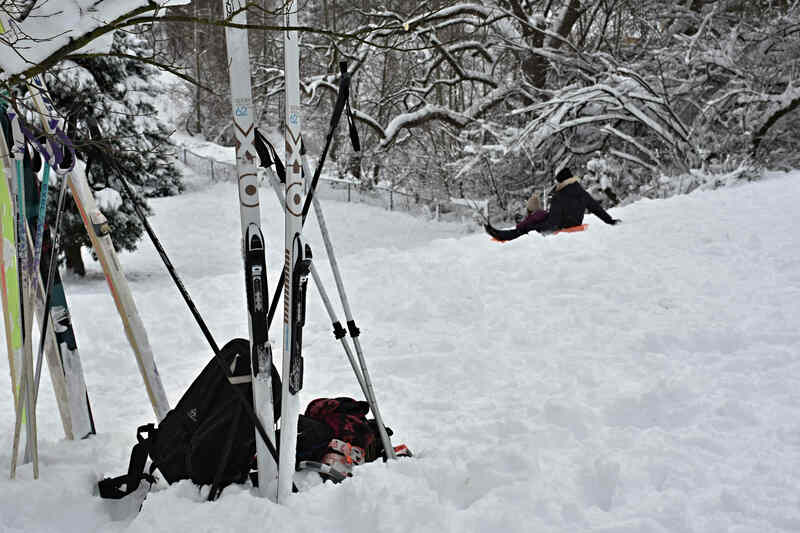 To be fair, Portland isn’t equipped to handle snow. Plows are few and far between, and gravel is preferred to salt to deal with icy roads. 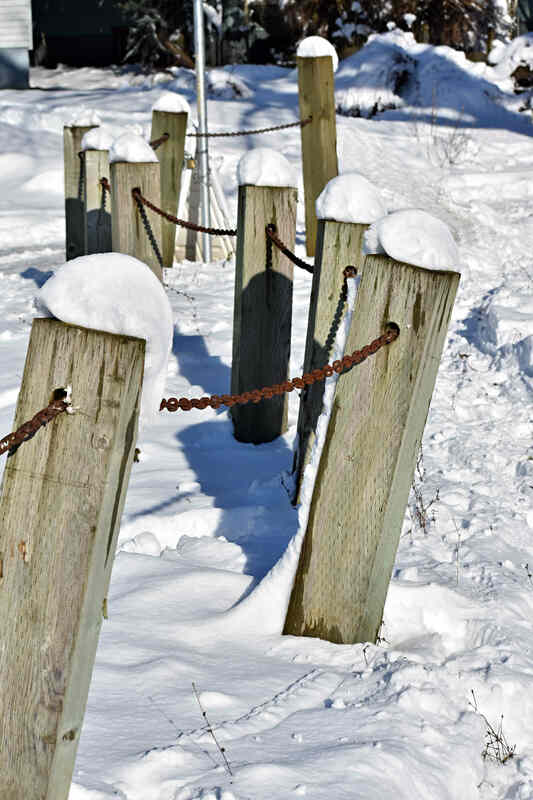 Folks from the Midwest may wonder why cars aren’t all rusted out here – that’s why. We’ve also got more hills to slide down, the midwest is much flatter. But mostly, folks just don’t know how to drive in snow. The same folks who forget how to drive in rain after a few dry summer months simply have no clue how to deal with packed snow and ice, sometimes abandoning their vehicles in mid lane rather than deal with knuckles white from something other than cold. So when the forecasted 1-4″ got buried under 6″ before we even went to bed, we knew it would be a good excuse to enjoy being retired, stay in, and avoid the craziness. Pillows of snow continued to build overnight as we hugged their warmer cousins while abed. 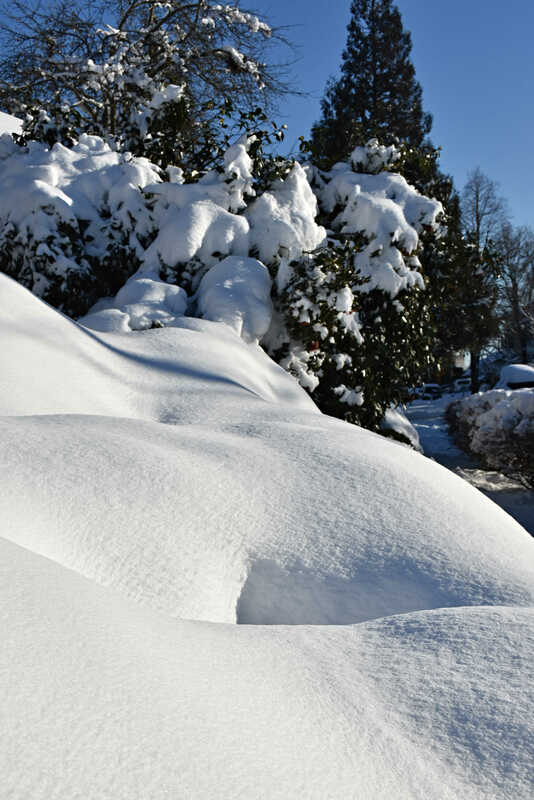 By morning, piles of puffy white, 12-14 inches (30-35 cm) deep stretched across the yard. My thought went to the birds. In particular the hummingbirds. Wizards of flight, but so tiny, and needing so much energy to support their frenetic lifestyle – how can we help keep them alive in the winter’s cold? We use a strategy of rotating feeders when we have a below-freezing snap. Although I have seen the little beasties use feeders that must be little better than a sweetened ice cube, liquid is better. Easier to get nourishment, warmer to consume. 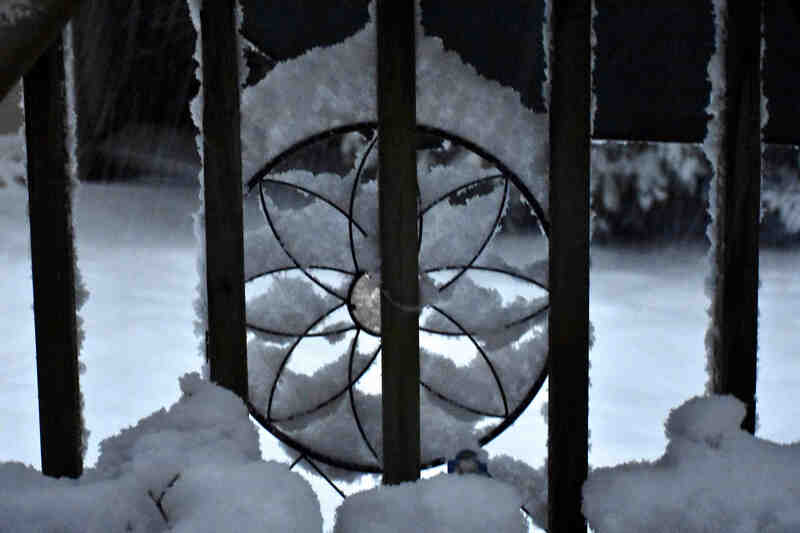 But on this morning the snow had buried the feeder. 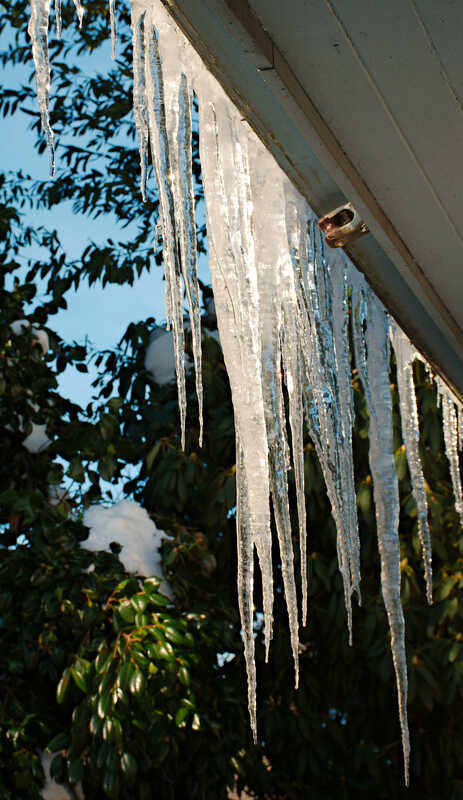 There was no way for this fellow to access even an icy meal. No wonder, when he saw me coming with the fresh, warm nectar, he set aside his fear, flew up, and fed while the feeder was still in my hand. He couldn’t have been more than a foot away. While my wife and I were not inclined to dig out the car, we did want to go exploring and see how all that snow transformed the neighborhood. Out came the boots and coats, and of course, that new camera I gave myself for Christmas. Walk? Ski? It’s all good. We didn’t get out until the afternoon. By that time the snow elves had already been at work. Snow is transformative. Things that might be ho-hum or even ugly under normal conditions take on a new beauty. Even something as routine as a tree next to a roof assumes unexpected patterns. Swinging by the park, we found we were not the only ones enjoying a winter outing. But in time we had to return home, to a chore and a test. The good news: both tasks were one and the same. The bad news: the task was shoveling snow. The test was for my back; how well was the herniated disk healing? Folks who’ve been following for a while know I screwed up my back last September. It’s been healing, slowly. But shoveling snow? Including the packed down stuff on the sidewalk? Yikes! The next day remained cold, but the heavens cleared. 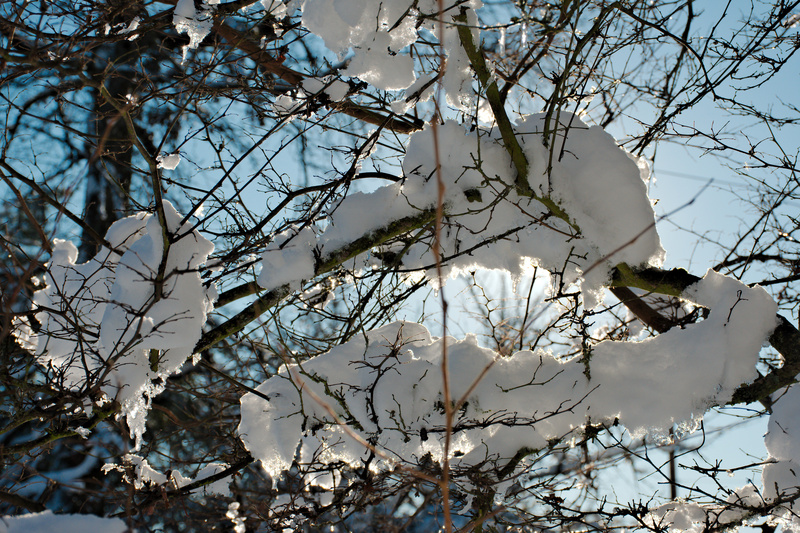 It was another excuse to check out the snowy world, only this time with a Portland winter rarity; blue skies and snow. 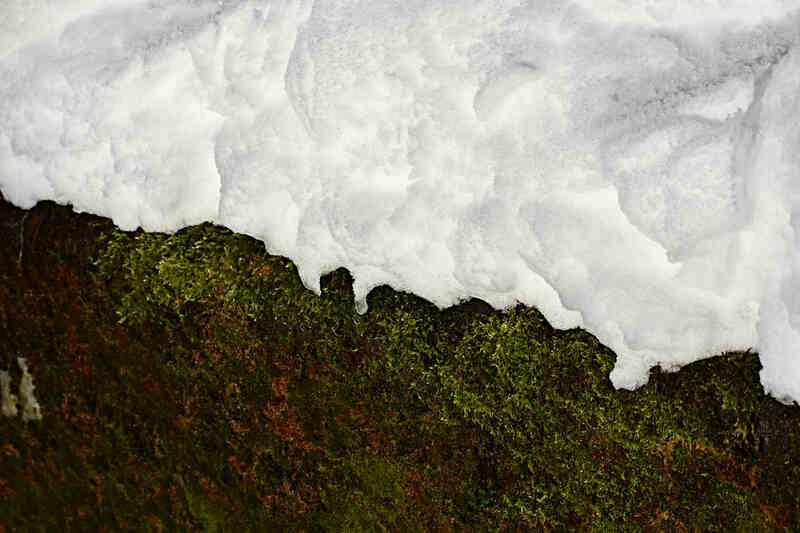 Portland doesn’t do snow well, but it’s expert at moss. It’s not often you see them side by side. 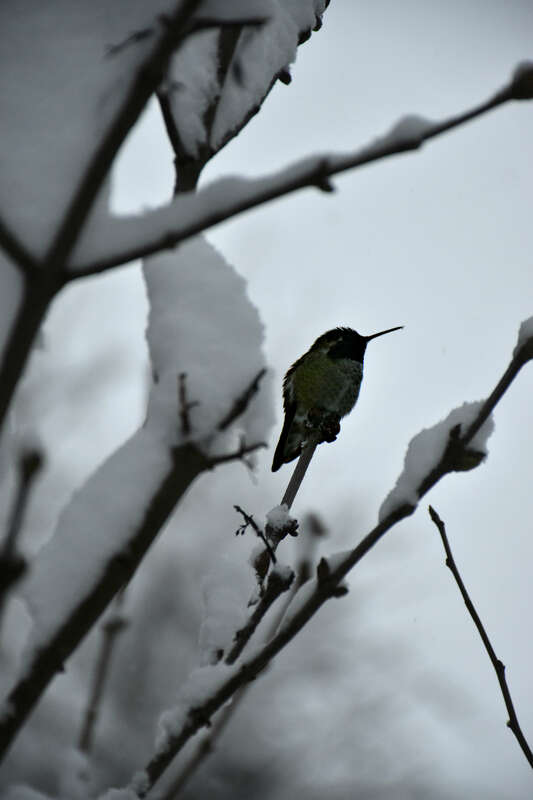 I can’t believe the hummingbird in the snow! Yep, Anna’s are pretty hardy. Frankly I don’t understand how any creatures survive extended sub-freezing temps. When the hummer was using the feeder in my hand I thought of the pictures you posted a while back of hummers feeding from a little cup in your hand. This is probably the closest I’ll ever come to that experience. Your photographs are beautiful! You are making me miss the snow!! I love a fresh snowfall that covers everything in a thick carpet of soft puffy white. So happy to read about your attention to the hummingbirds and concern for their survival. You got a lovely reward too. Thanks! 🙂 It’s been fun to have the snow around for a while, but I’ll be happy to see it move on too. That will happen soon, but due to warm, heavy rains – a recipe for flooding. This winter likes excesses. You make it to Chicago yet? Currently in Indonesia, en route to Chicago. I fear more than the cold w the current events in the US. Shudder. I suspect things will be a bit chaotic the next few months, until the GOP figures out they’ll still be in power if they impeach the primary source of the chaos. Time will tell. Thanks Brick. We don’t get snow that often, and we haven’t had that much in many years. It was a golden (white?) opportunity for good photos. 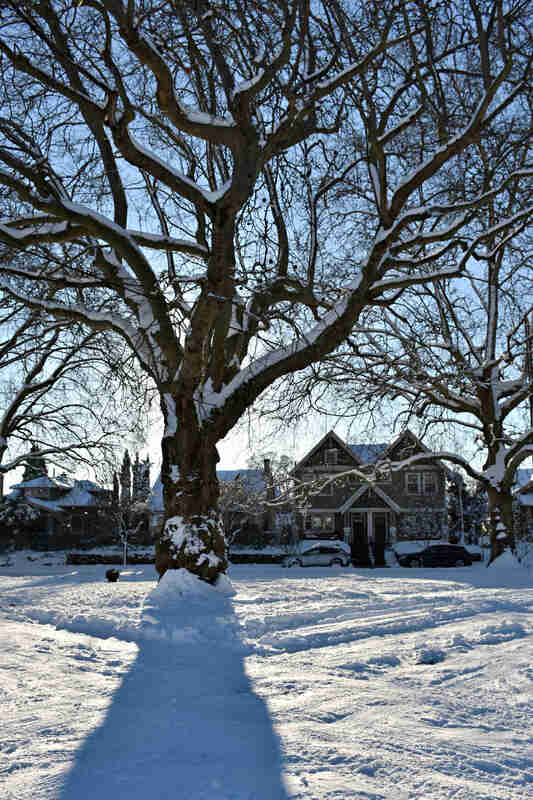 Well well, you say that Portland doesn’t do snow but, had the same amount fallen over London, civil war would’ve ensued. I like Portland, it seems a nice enough place! Enjoy the snow whilst it lasts.. I hate when it goes all slushy. Interesting point. I don’t know if I’ve even seen pictures of London in snow. It’s unlikely, because when it all descends into chaos and you have people with pitchforks and clubs (picture Mad Max but without the desert) it’s hard to find the time to take photos! 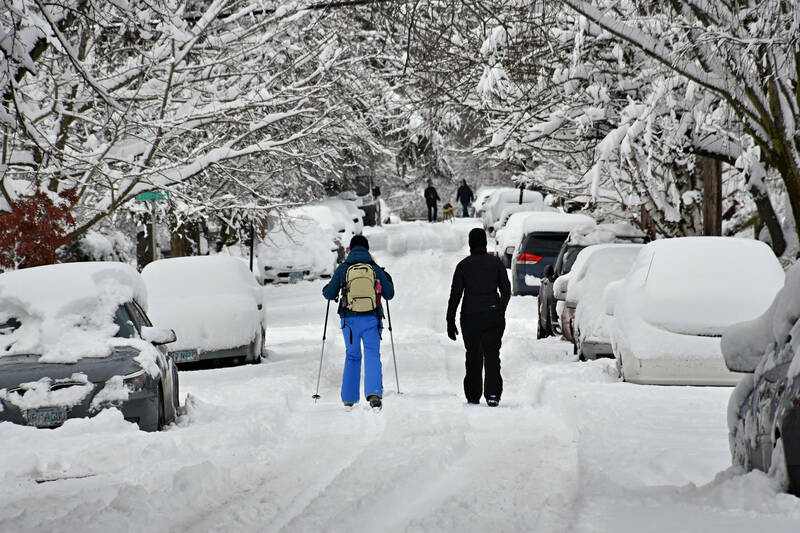 I enjoyed your account of the peculiarity of snow in Portland. I had to laugh when you said that the snow shut the city down. I’m originally from Michigan, so this would be just a regular snowy day. Good to hear your back held up with the shoveling. I can imagine that not many people feel the need for snowblowers around those parts. We’re more used to snow here, but I’m still always struck by how pretty everything looks after a fresh snowfall! And you took some wonderful photos of it, too. Enjoying snow is easy when you don’t have anywhere you have to be. I heard that Portland really got hit, and doesn’t have the resources or experience to deal with it. Glad you stayed safe, and be very, very careful shoveling that snow! Yep, the cars haven’t moved for a week! 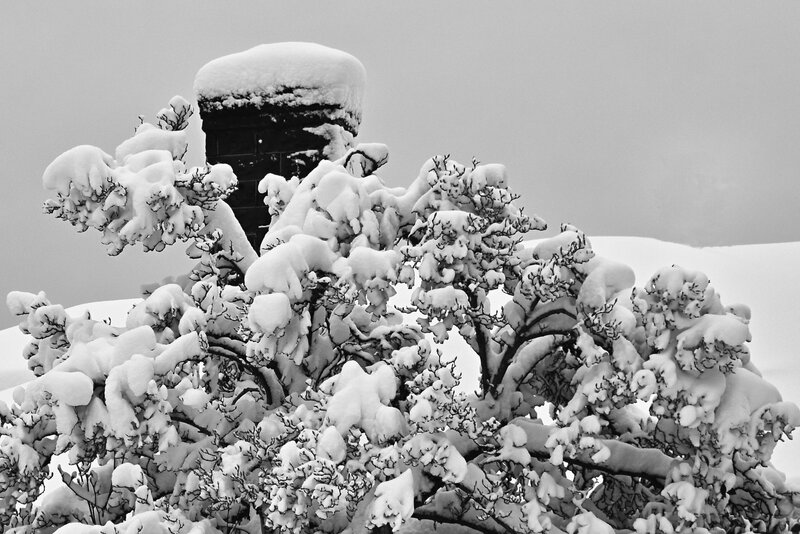 Still wearing their crowns of snow, but that’ll change soon – the rain’s a-coming! Thanks Dave. Any snow in AZ this year? In the upper elevations, yes – in fact, there’s some on the Catalina and Rincon Mountains now. But down here in the city, nope. Not even a hard freeze yet. Love your pictures, as well as your tale of the hummingbird. We have an Anna in our yard. Right now our Cape Honeysuckle is in full bloom, so he’s quite happy where he is! What a great post! Descriptions, pictures: you don’t need to travel to have adventures. Poor humming bird, and I’m so glad you were prompt with his/her breakfast. And that your back was up to the snow-shovelling challenge. We get wild winds and rain here in Wellington, but we very rarely see snow. Certainly nothing that you’d call snow. A light dusting gives us all a thrill. Nah, that’s not cheating. It’s lateral thinking. You’re far too modest, Dave. I was wondering what sort of reaction folks from snow country might have. I was kind of expecting the same as what I had when I first moved here. Gems is a good description for hummingbirds, I’m glad they stick around all year, even if we do worry about them when it gets below freezing. I love the hush a big snow like that brings. It muffles the vehicles and everything around, and I enjoy taking a walk in it as well as watching it from a cozy window as it falls. Then I like it to leave quickly with no mud and make way for spring! True, all the rounded corners does tend to muffle the noise. That and the clean white adds a certain purity to a winter stroll. But I’m also glad it’s not here for the duration. So, so pretty. And good on you, for thinking of the birds. Good stuff. Go back to bed now. I’m off for a bath. 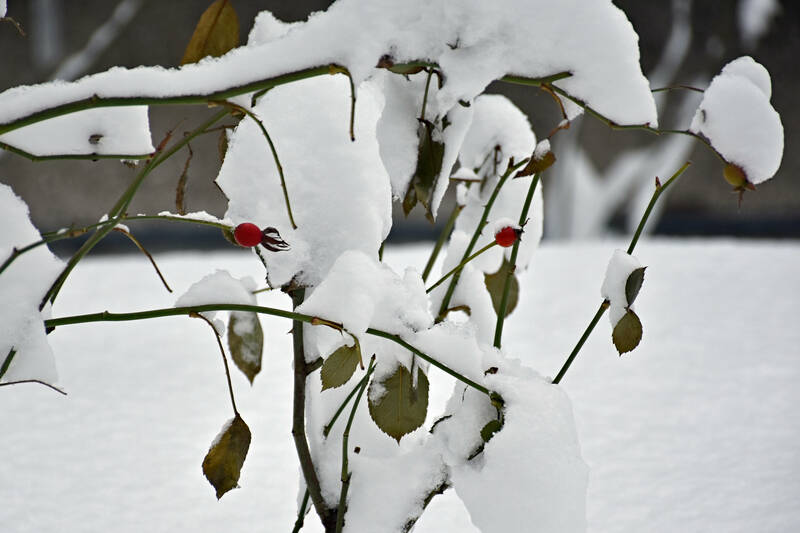 A fresh coat of snow is a bit like a fresh coat of paint – it refreshes and purifies. And smells better too! I’m envious; we’ve had next to no snow here in the Quad Cities this year. My snowshoeing plans have been put on hold, indefinitely. That’s one advantage of living out here – we don’t have to routinely put up with snow and ice in the winter, but if we do want to play in it we can always drive up into the mountains. That’s a nice way to get your fill of the snow! It’s looking like we’re not going to get any more at all this winter! I sure hope that’s not the case. “Little did we know” sums it up perfectly. When my wife came home and told me it was snowing, I didn’t even bother getting up from my chair even though that’s the type of news that usually excites me. I just didn’t think it was going to amount to anything. One full week later and it is just now finally beginning to melt. Are you on Instagram by chance? I do have an Instagram account and posted a few shots there, but I don’t spend any time to speak of on it. WordPress already takes up plenty of time and I’m not really interested in spending more trying to develop a following over there. It’s also kind of a pain if you’re not using a phone app to access it. I was just going to follow you because I like your pics! You do have a good eye. Great pictures, Dave! My boys have been really pining for a snow event like this but so far this winter all we’ve had is a two hour school delay one morning because of a quarter inch of slush, lol! We did get to wake up to snow out in Port Angeles one weekend, last month. Careful with that back…… the shoveling might be better left to some eager neighborhood kids. I bet they’d have a blast, playing in the snow. 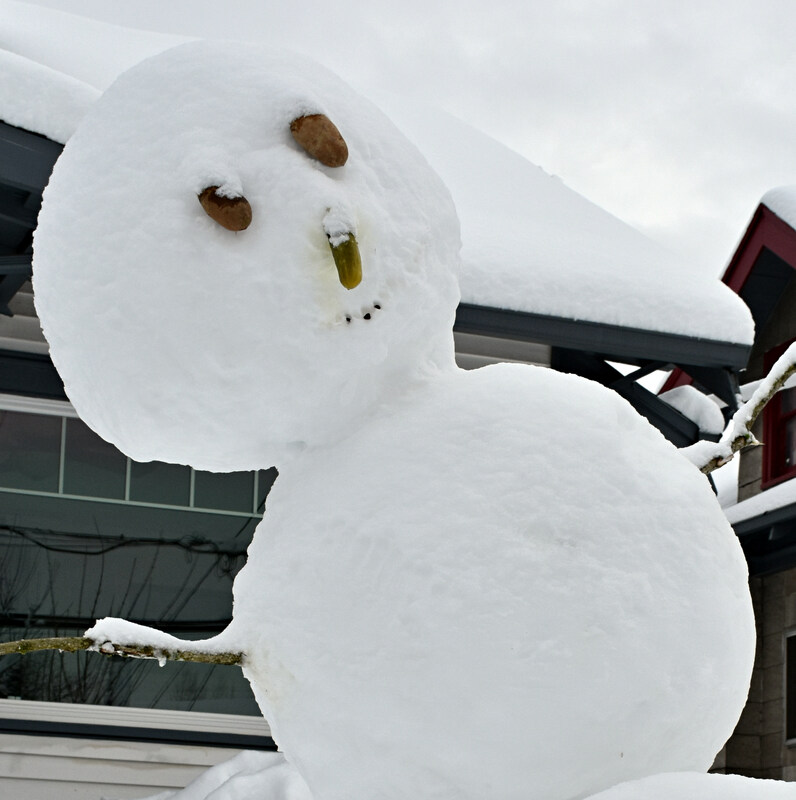 But the big question is, what would they use for eyes, nose, and mouth on the snowman? Thanks for the perspective Dave. I’ve been grumbling about snow that still clutters the streets here in Bucharest more than a week after the last big snow fall. The photos are amazing. 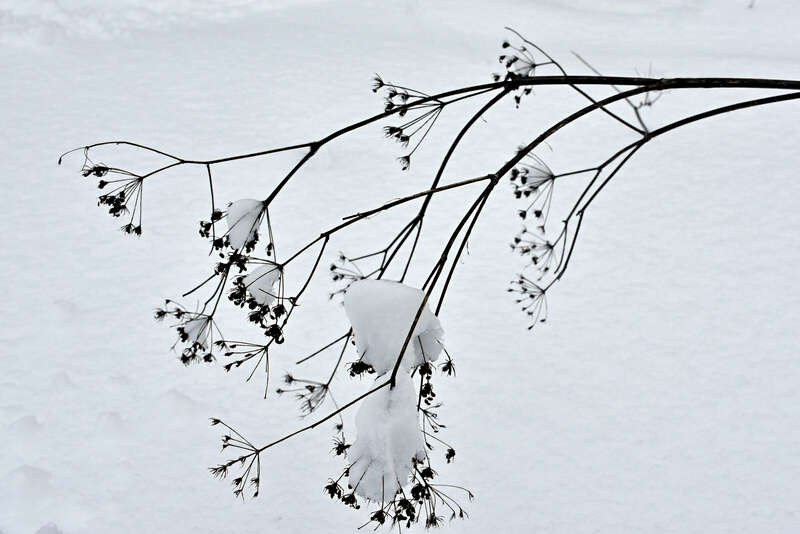 Particularly the one titled snowy petals. Would be excellent as inspiration for a sketch. Sketch away! My drawing skills barely extend even to a stick man, so that avenue is beyond me. We’re back to our usual rain now, and the snow is nearly gone. Sweet! Given enough time, I can sketch a decent stick man, so I’ll give it a shot. If it turns out to be “fridge worthy” I’ll let you know. I never think about hummingbirds being in snow, but I guess they have to put up with whatever the weather throws at them just like everybody else. I see your new camera is taking some great, clear photos, Dave. (I’m sure you did your bit too, of course.) It’s also very good news that your back is holding up. I hope it won’t have to put up with much more testing, though! 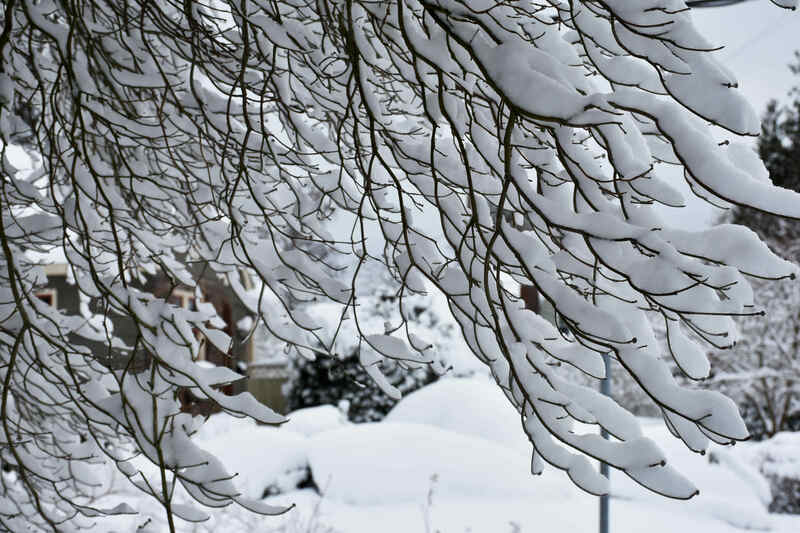 Snow is beautiful, but it isn’t always very convenient. I don’t blame the others at all. I’d fly south too if I had the option. I grew up in Montana and now remember when I was in southern Germany hearing and seeing how the entire city was shutting down, cars weren’t moving and trains stopped in their tracks all because there was a light sprinkle of snow. It melted by the afternoon, but the whole experience was really something else. My brother lives in Portland now and never even sent me pictures so I’m glad I came across yours, they’re so beautiful! Also good for you for feeding that poor little hummingbird. Hmm, you’d think southern Germany would be more snow ready, what with the Bavarian Alps next door. I guess we valley dwellers are a bit too sheltered. Thanks for stopping by. You found a hummingbird in the snow! 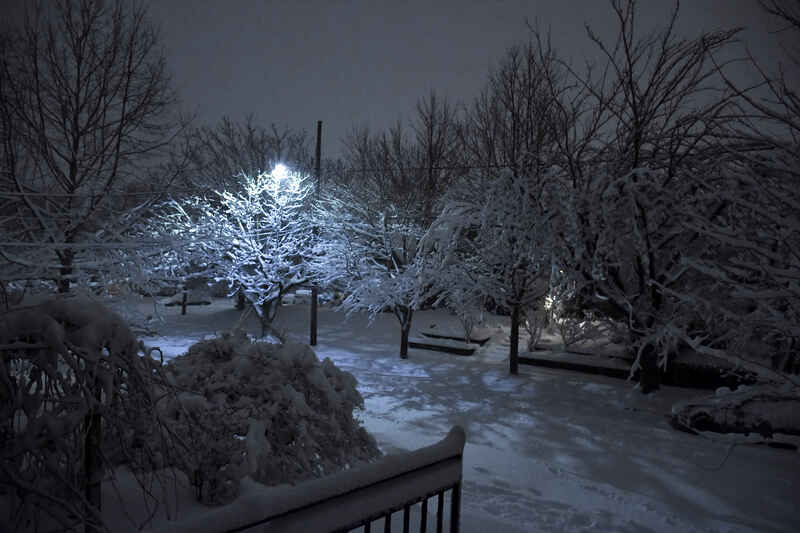 I also love the first two wintry evening photos. It wasn’t hard to find the hummingbird, it was his living room. That much snow was the unusual part. Thanks for dropping in. Brr! Your photos take me back to our Christmas trip to Pyeongchang (the venue of the 2018 winter Olympics). We had a white Christmas and while I enjoyed the isolation of being snowed in the mountains, the lodge owner didn’t find it as exciting. 🙂 Your photographs look amazing and looks like your Christmas gift was a good spend. Thank you. ☺ Now that we’re back grey rainy skies it’s not as easy to get motivated to get out and get some shots – guess I need to hope for better weather. Really enjoyed your pictures. Now I want to roll in the snow. We’ve had some snow in NY but not enough to go have some fun in. This was totally enjoyable, I was house bound for the better part of it all, a little virus had gotten a hold of me, thank you for the virtual tour . We had a white Christmas and while I enjoyed the isolation of being snowed in the mountains, the lodge owner didn’t find it as exciting. This was totally enjoyable, I was house bound for the better part of it all, a little virus had gotten a hold of me, thank you for the virtual tour .